A classic comfort food dessert. Bring water and salt to a boil in a small pot. Add rice and stir. Cover, reduce heat and simmer for 30 minutes until tender. Add raisins during the last 10 or 15 minutes to plump them. Meanwhile, in top of double boiler combine sugar, flour and ⅜ teaspoon salt. Stir in milk slowly, mixing after each addition so there are no lumps. Cook, stirring constantly, until thickened. Add a small amount of the cooked milk mixture to the egg yolks, stirring as you add it. Then stir the egg yolks into the milk mixture in the double boiler and cook for 10 minutes. 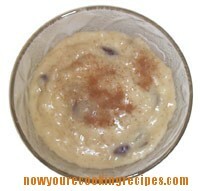 Remove from heat and stir in rice, raisins, vanilla, nutmeg and cinnamon. Serve warm or cold. It’s very, very creamy! Rice pudding must be the ultimate comfort dessert, a familiar favorite from everyones’ childhood. Serve sprinkled with additional cinnamon.